Thickness? I measured it to be 6.77mm on the thinnest part. This code here *#*#6865#*#* can be used to write IMEIs if they for some reason should be missing. Download the app called "LG Touch LED Notifications" from the Play Store and notifications will then flash via the 3 touch buttons with white light. (I have tested this and it works like a charm). The UMI ZERO is currently one of the most Anticipated smartphones from China. The last two months it has been hyped on the Internet and on a lot of channels, and with the UMI ZERO, UMI wanted to start on a new era and create something new. The UMI ZERO comes with top specifications like Super AMOLED display, Double-sided Gorilla Glass 3, Rapid Charging, 2GB RAM, Camera with aperture f/1.8, the MTK6592 Turbo CPU and is only 6.4MM thin. 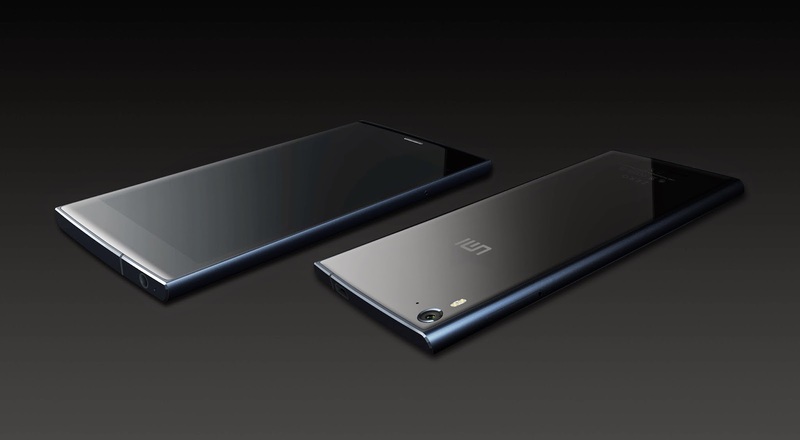 So in terms of hardware the UMI ZERO is in front, but how will it do in real life? I have now tested the UMI ZERO for about 1 week to see how the performance is. Note, that the UMI ZERO that I tested is a demo unit with beta software (UMI.V3.01), so the final version could be even better once the firmware is better optimized. When I received the UMI ZERO, the first thing I noticed was the amazing big box and packaging that the phone comes in. It was not just a boring standard box, but a box with a really nice sharply design which fits the ZERO perfectly. In the past I have seen similar on other phones from Xiaomi and OnePlus One. The first thing I saw when I opened up the box was a big silver Z. At first glance it looked like metal, but it turned out to be some kind of case that you can use to protect the UMI ZERO. The phone itself feels really premium. It is totally made of metal & glass and kind of heavy (in the good way) in the hand, there are no real plastic parts on the phone, and the metal "superbody" together with the double-sided Gorilla Glass III glass makes it feel really high-end and expensive. Some could be a little anxious about the double-sided glass, as it probably would not survive a drop from a higher distance. When the screen is turned off, the phone looks totally black - it has this kind of "Stealth-Look" to it, that makes it look cool and mysterious. The screen with 1920x1080 pixels on the UMI ZERO is providing a sharp colorful picture, and black is really deeply black and will not use any power. So it is easy to see that it is using an original full hd Samsung Super AMOLED screen. While I tested the phone it was a pleasure to use the screen and both text and graphics were always really good to read/watch. Unfortunately, the UMI ZERO has no notification LED. And when you receive a SMS, or you have a missed call. You are not able to see that in any way. I would have liked a notification LED in the top of the phone, or maybe a solution where the touch buttons would flash to notify you. Also the touch buttons could be a little brighter in my opinion. UPDATE: You can use the 3 touch buttons light as a notification! with the app called "LG Touch LED Notifications" it just requires ROOT and works great on the ZERO. The UMI ZERO comes with a ROM based on 4.4.2 KitKat, the UI looks very stock (like Vanilla Android) with only small optimizations and changes made by UMI. Inside the settings I also found a Powersaving & Extreme Powersaving mode and the brightness control support "economic brightness" that should save some battery. I did not find any features like Off-screen gestures or double tap to wake, that many other China phones today offers but I believe that the final UMI ZERO ROM will have more features, and that the limited features on mine is because of the beta ROM. Inside the UMI ZERO we find the MTK6592T Octa Core chip-set, where T stands for "Turbo". Normal Octa Core phones run with 1.7Ghz, while the Turbo version runs with whole 2.0Ghz. While I used the phone, it was very smooth in the UI and the overall performance was good. Regarding 3D gaming, it also performed really good, and games like Modern Combat 5 ran smooth with the highest graphic settings without any lag. In Antutu 5.1 the UMI ZERO scored 31200 points which is significant better than on other standard Octa Core phones. The 13 mega-pixel camera (20 mega-pixel interpolated) provides some nice pictures, most pictures I shot with the UMI ZERO were sharp, with good contrast/colors and with minimal noise or blur. The auto-focus is fast and precise. I would definitely say that the camera is above the normal standard that we find on many other china phones. The GPS is fast on the UMI ZERO when your outside and have an open sky. It only takes some few seconds to get locked on the satellites. I found that the Voice & WiFi reception is pretty standard, not really better or worse than on other phones. I was pleasantly surprised by the good sound-quality (from the ear-piece) when I spoke with people using the UMI ZERO. The sound is very loud and clear, and it is easy to hear the part in the other end. Regarding the speaker on the back, it was also good and loud and perfect for gaming, but when the phone was laying top-down on a table, the back-speaker would be a little blocked and the sound would because of that, then be a little lower. During my test with the UMI ZERO, I only experienced good battery-life. Inside it has a 2780mAh mah and it can easily last a whole day or more with normal usage. And with the Extreme Powersaving mode enabled I am sure it can last even longer. The Rapid Charger feature is also a very nice thing, and is possible because the charger is on 2,4A. You could say that the rule is, that the charging time up to 80% is about 1 minute for 1%, so 20 minutes would charge the phone about 20%. If you are looking for a stylish phone made of high-end materials and with some good specifications, and the price is no problem. Then the UMI ZERO would be a very good choice. In my opinion, the UMI ZERO delivers good performance & build-quality above the normal standard on the market and really worth the extra money. Great work. Thank you for all the great reviews and trust-wording information. So far you've the best videos and info also in xda forum. Thank you too Miguel for the kind words! Does it support offscreen gesture, in the Newest firmware ? No I don't have that yet on mine. But I guess there will soon be a newer firmware out for the phone. But have not got anything yet from UMI.